You can create your own customized editable version of this contract document using Human Resources Contract Pack. Follow these steps to get started. Use the Durable Power of Attorney Agreement to ensure a third-party has the legal rights to perform tasks needed to keep an operation running. This is common in partnerships and situations involving joint right of survivorship or stranding of assets or access to accounts that are business critical. again the most minor of normally overlooked clauses have saved our collectives asses when things turn rough with a particular client. Proposal Kit IS the reason we are still in business; a PROFITABLE BUSINESS after all these years." 1. Get Human Resources Contract Pack that includes this business contract document. This Durable Power of Attorney Agreement is included in editable Word format that can be customized in Word or by using the included Wizard software. Once you have ordered and downloaded your Human Resources Contract Pack you will have all the content you need to get started with your own formal declaration. I, First Last, the undersigned, residing at Address do hereby appoint Designated Agent Name ("Designated Agent") of Designated Agent’s Full Address as my attorney in fact to handle all of my obligations and duties that I handle on a daily basis. Designated Agent Name is hereby granted the power of delegation and substitution in regard to the administration of my obligations and duties. This Durable Power of Attorney shall become effective on the date below and shall remain in effect until my death. This Durable Power of Attorney may be rescinded by either party by providing written notice to both the undersigned and the Designated Agent. I hereby revoke, as of the date on this agreement, all previous powers of attorney in existence, except for any Health Care Directive(s), which shall remain in full force. 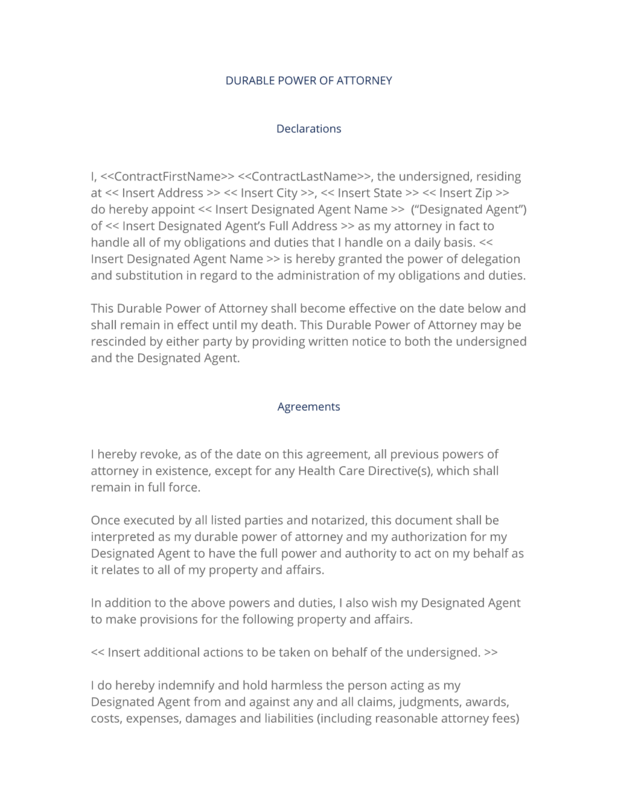 Once executed by all listed parties and notarized, this document shall be interpreted as my durable power of attorney and my authorization for my Designated Agent to have the full power and authority to act on my behalf as it relates to all of my property and affairs. In addition to the above powers and duties, I also wish my Designated Agent to make provisions for the following property and affairs. Insert additional actions to be taken on behalf of the undersigned. I do hereby indemnify and hold harmless the person acting as my Designated Agent from and against any and all claims, judgments, awards, costs, expenses, damages and liabilities (including reasonable attorney fees) of whatsoever kind and nature that may be asserted, granted or imposed against Designated Agent directly or indirectly arising from or in connection with the execution of this Durable Power of Attorney as well as any error or omission made in good faith by my Designated Agent while carrying out such duties. Designated Agent shall not be held responsible for delay or failure in performance hereunder caused by acts of third parties, nature, strikes, embargoes, fires, war or other causes beyond Designated Agent’s reasonable control. If any provision of this agreement is held to be unenforceable, the enforceability of the remaining provisions shall in no way be affected or impaired thereby. This agreement and any disputes arising hereunder shall be governed by the laws of State, without regard to conflicts of law principles. A failure by any party to exercise or delay in exercising a right or power conferred upon it in this agreement shall not operate as a waiver of any such right or power. Designated Agent shall be compensated for his/her services at a rate or as determined by law, and shall be reimbursed for all expenses deemed ordinary and necessary that are incurred during the execution of any duties as my Designated Agent. This document was acknowledged before me on this Current Day day of Current Month, Current Year by Insert Designated Agent Name (Notary's full legal name). The complete Durable Power of Attorney Agreement - with the actual formatting and layout - is available in this Contract Pack.